The Rook is a very powerful piece and it is sometimes called a castle (because of its looks). It is known in the medieval days that powerful cannons were fired from the top of the castles to keep invaders away. Thus, in Diagram #1, the rook attacks in a straight line either from top to bottom (vertically along files) or side to side (horizontally along ranks). 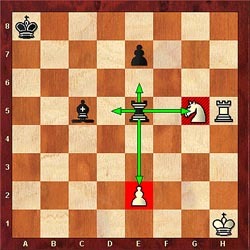 In Diagram #2, the black rook can move as far as there is nothing blocking its path. 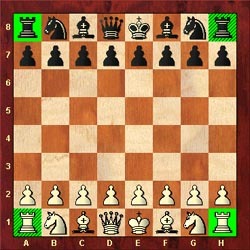 The black rook can capture the white pawn on e2 or the white knight on g5 by removing the piece and taking control of that square. 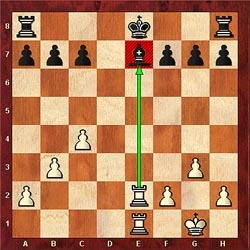 However, the rook cannot jump over the white knight on g5 to capture the white rook on h5. The rook belongs on open files and ranks for swift movement. 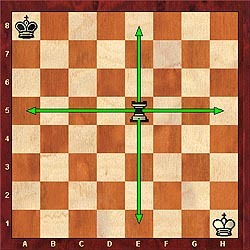 Rooks are best placed toward the center of the board because the central files usually open up very quickly. In addition, it is good to have rooks "doubled" on the same file or rank to strengthen the attacking power. In Diagram #3, the two rooks have a powerful attack along the e-file. 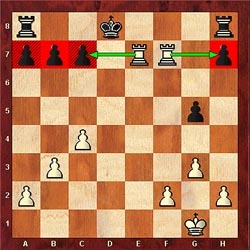 In Diagram #4, these same rooks have reached a "dream position" and are now doubled along the 7th rank threatening to capture all of the black pawns. Incidentally, there is something called a "super-Rook," but let's hope you never need one. More on that later.